The New Fender American Acoustasonic Telecaster! 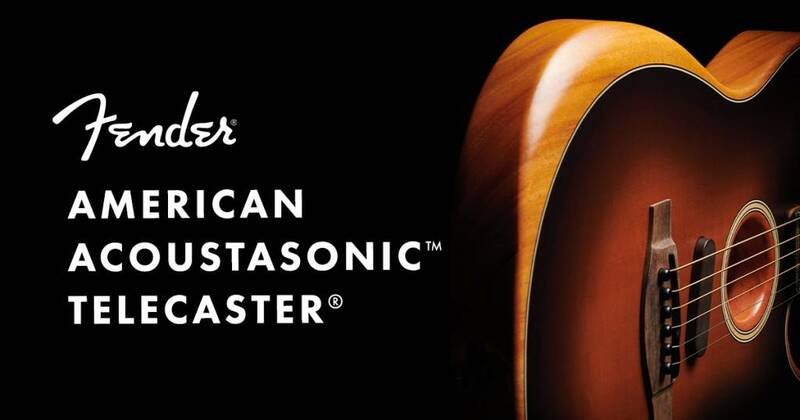 We are excited to announce, on behalf of Fender, the new American Acoustasonic Telecaster! Click to learn more about this amazing guitar that is sure to be the talk of the NAMM Show! The American AcoustasonicTM Telecaster® embodies the spirit of purposeful innovation that Fender was built on. From acoustic shape-shifting to electric rhythm tones, this powerful guitar uses a revolutionary Fender and Fishman®-designed Acoustic Engine to deliver new sonic expression from the studio to the stage. Elegantly simple, the Acoustasonic Telecaster was designed to inspire – mixing future technology with organic feel and playability as a way to connect artists to their music. The fully hollow body features an integrated forearm contour and our patent-pending Stringed Instrument Resonance System (SIRS) – designed to deliver a naturally loud voice with lively harmonics. A smooth-playing mahogany neck and open-pore satin finish make this cutting-edge guitar comfortable and easy to play. On stage the Acoustasonic Telecaster eliminates many of the challenges associated with playing an acoustic guitar live by cutting out feedback, and making it easy to access the sounds you need without switching instruments. The Acoustasonic Telecaster is powered by the Fender and Fishman®-designed Acoustic Engine – proprietary blend of classic analog and future technologies that optimize the guitar’s natural sound, and then modify the resonance to deliver a curated collection of voices. These acoustic and electric voices can be played solo, or blended via the Mod Knob to create new sounds. They can also be used simultaneously, courtesy of the Fender Acoustasonic NoiselessTM magnetic pickup.